Uses: Induction and maintenance of general anaesthesia. Chemical: Halogenated methyl ethyl ether. Structural isomer of isoflurane. Presentation: Clear colourless liquid with a sweet smell (should be protected from light). Mode of action: Mechanism of general anaesthesia remains unclear. Routes: Inhalation, via a calibrated vaporiser. Induction dose 1-10%, maintenance 0.6-3%. Cardiovascular system: Mild negative inotrope, marked decrease in systemic vascular resistance, thus leading to a decrease in mean arterial pressure. Causes a reflex tachycardia. Decreases coronary vascular resistance. Sensitises the myocardium to circulating catecholamines. Respiratory system: Powerful respiratory depressant. Decreases tidal volume, although may increase respiratory rate. Decreased response to hypoxia and hypercapnia. Non-irritant to respiratory tract. Causes bronchodilatation. Inhibits pulmonary macrophage activity and mucociliary activity. Central nervous system: Principal effect is general anaesthesia; little analgesic effect. Causes increased cerebral blood flow in concentrations >1 MAC. May induce tonic/clonic muscle activity and epileptiform EEG traces. Causes a marked decrease in skeletal muscle tone. AS: Decreases splanchnic blood flow due to hypotension. Genitourinary system: Decreases renal blood flow and glomerular filtration rate. Tone of pregnant uterus is reduced. Toxicity: Trigger agent for malignant hyperthermia. Isolated reports of hepatotoxicity. Theoretical risk of fluoride ion toxicity in renal failure. May cause myocardial dysrhythmias. Distribution: Initially to areas of high blood flow (brain, heart, liver and kidney). Later to less well-perfused organs. Metabolism: 2.4% of dose is slowly metabolised in the liver (oxidation/dehalogenation). 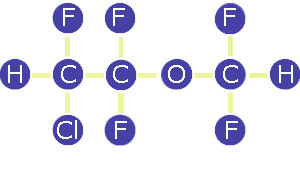 Plasma fluoride ion concentrations may reach 10 times those observed with halothane or isoflurane. Excretion: More than 80% exhaled unchanged. 2.4% in urine as fluorinated compounds. Special points: Potentiates action of non-depolarising muscle relaxants. Not recommended in epileptic patients. (a) is a halogenated methyl-ethyl ether. (b) has a blood/gas solubility coefficient of 1.43. (d) increases the tone of the pregnant uterus. (e) causes a decrease in systemic vascular resistance.